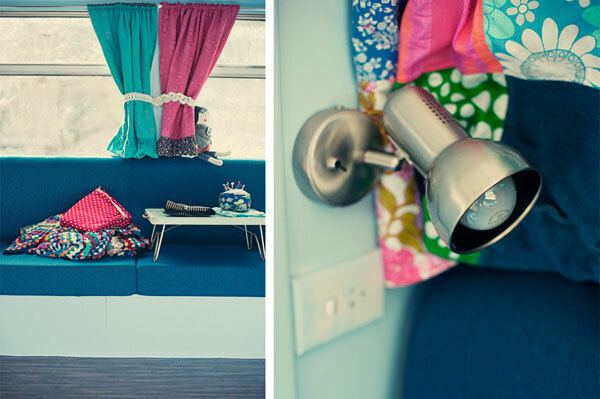 The day before we left, our amazingly talented photographer friend Rohan Anderson came over and took some pics of the caravan. I like to think of them as after the renos-before the fun photos. There's more, I'll pop them on here over the next week. And thanks so much you guys for all your fabulous caravan adventure well wishes, they never fail to make me smile. we will all be thinking (dont mind me speaking for everyone, what a cheek hey?) 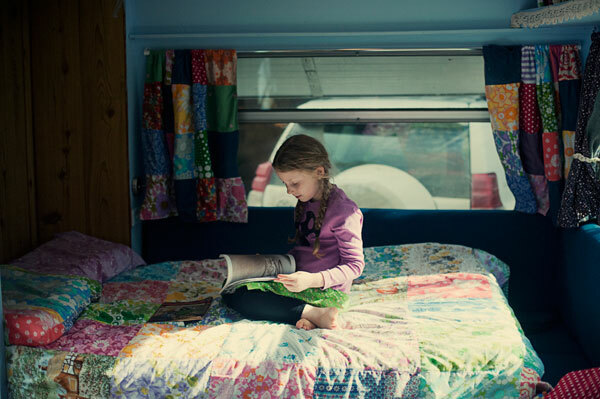 that we wish we had thought to take shots of inside our cabins and caravans in a more documentary style when on holiday. It's SUCH a bad feeling to be this jealous!!! I love it and I LOVE what you're doing! Good luck on the temporary homeschooling! It's fantastic! We've just passed our first semester! i love your amazing mobile home! enjoy your travels and I look forward to following your adventures! such a lovely space and such a brave move but one you will not forget. I have done the brave move from Sydney to London then Melbourne then the Central Coast and finally Sydney back to Melbourne. wish you all the best. living through your blog and tweets. Wow - these photos are amazing! Your van RULES! its so swarve (is that a word? )...styley...groovey...awesome....Ummm I'm jealous!! 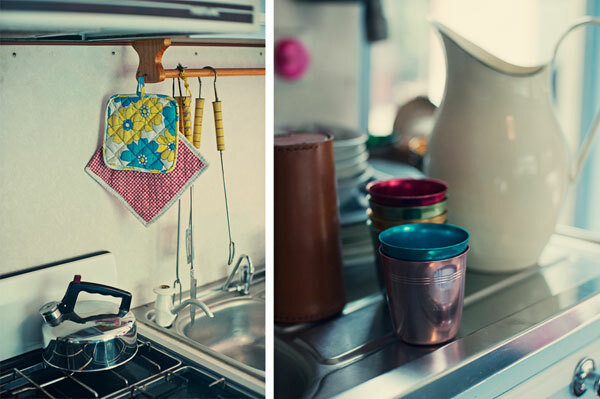 Excellent photp's - it truly looks like a home away from home - cosy and pretty and lovely! Looks like you're already having the most fun ever!!! sweet stuff, darlin. I'm glad the voices are slowing down. If you need to visit any wet chookens, just pop on by. I LOVE it!! Awesome styling, awesome photos. Hope you're having a heap of fun out there already! 1. Do you also have a picture of the van? It looks so roomy inside, I am curious to see the car from the outside. 2. Isn't it wintertime over there in Australia? Is it usual to make a road trip when it's cold? Sorry, I am from Europe and in winter we are enjoying snow or fly away for a holiday in the sun. Wow, all that caravan needed was you guys! You have done the van up so beautifully. Just as Alison at Lark is letting out her house for holiday makers, I reckon this caravan matches the stakes of being just as graet! Enjoy! Have fun! Sending Love! The van looks absolutely fantastic. I'm so looking forward to hearing about all your adventures. It is absolutely divine! We're definitely getting a caravan again. I am so very jealous. Such a great job guys. Have an awesome trip & enjoy your adventure. Beautifully decked-out and beautifully captured... and the beginnings of some fabulous memories for each and every one of you. Safe and happy travels. love love love! holy moly I;ve missed a lot of news! hope you have a ball! I was telling hubby we need a caravan after going to echuca we saw caravan dealers and at car dealers! we just don't see too many in sydney! Gosh, it looks SO good! You've really managed to make that little space a beautiful home. It's kind of hard not to be jealous... Good luck with this exciting new adventure! I can't wait to read more as your familys' journey unfolds. Ooh, I want to move in. Just divine! 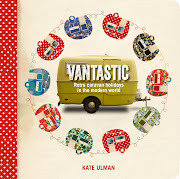 These are so amazing Kate. I love those doona covers. Enjoy your trip! Can't wait to hear all about it .xom. Filled with caravan love and envy! Hope you dudes are having a ripping good time. 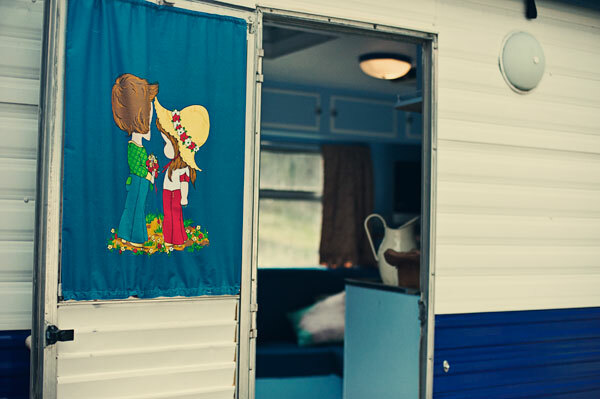 I am in love with your caravan! The colours!! The curtains!! The quilts!! I hope you're really pleased with yourself because you should be. That is the coolest caravan ever you've got there. What an amazing job you all did, love the colours and all your handmade touches....best of luck and cant wait to read all about it. Wow I spy the owl I made in the pictures.... yay! 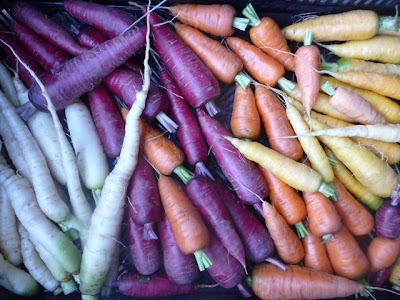 It's a dream in technicolour! You've done a marvellous job of decorating, it really looks so homely and comfortable. It has been already said, this is not a caravan, it is a home. You have done so much, it looks beautiful and cosy, a lot of work but worth it. It looks amazing! well done ! - your daughter's book is "Put me in the zoo". I hope you are your little animals have a fabulous trip! I wanna come along toooooooo .... can you just stop by the UK ..??? We are also doing up a caravan - 1950's - so it was fantastic to see these pics - I have shown some on my blog with a link back to your blog of course but let me know if you'd rather I took them off. Happy just to link without the photos if you'd prefer. Good luck! Caravan is totally awesome! LOVE! ADORE! WEEP WITH THE SHEER LOVELINESS OF IT ALL. 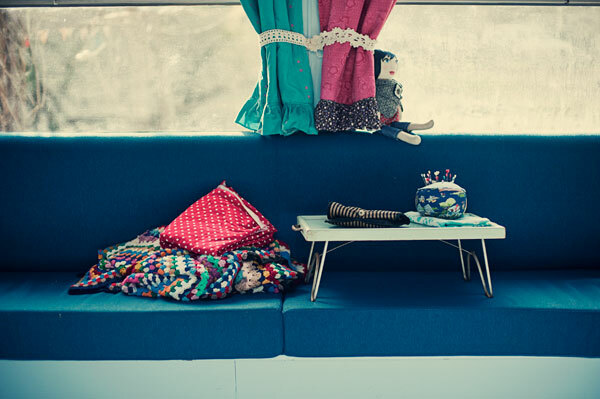 It really is a dolls' house for grown ups. 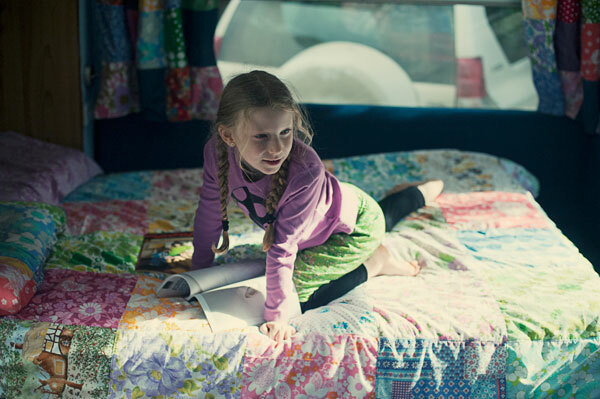 I love everything about this, your van, your story and your family adventure. We inherited my parents 70's van and I'm in the process of making it kitchy and cute and hope to do a little family weekend in it soon.What an amazing experience for your family, wonderful lifetime memories will be made. Professional indemnity Insurance : If you need Professional indemnity Insurance click Professional indemnity Insurance and get a quote from the specialists. Oh my! 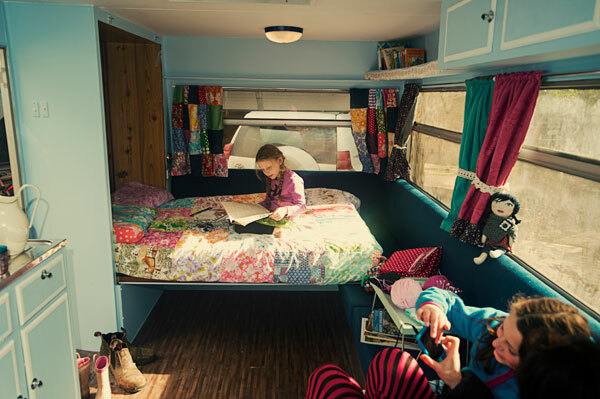 I love love love everything in this van and it just looks like such a beautiful space for your family to enjoy together! Delightful! :) Did you make the gorgeous bedspreads!?! Lovely! Oh gosh, I read the article with these photos published in the magazine. 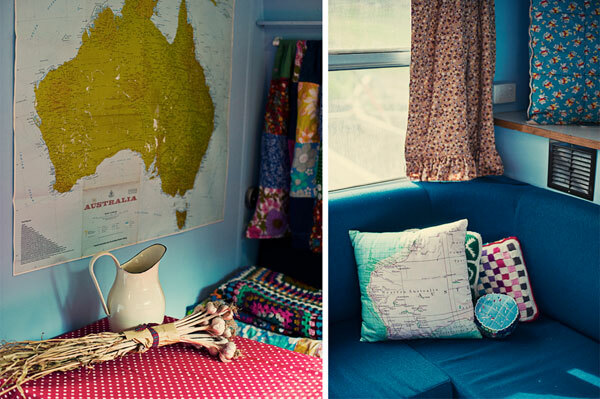 I absolutely loved the photos and the article, it was the inspiration for the curtains and cushions in my kitchen nook. And then, just today, I find your blog! How exciting! es maravillosa, me encantaría poder tener algo así. ¡¡¡preciosa!!! Those tin? cups take me back to the seventies! I wanted to make a suggestion...Spotlight does an oil cloth the looks exactly like your table cloth only that it's like vinyl. I have it on my dining table...no fuss with textas, drink spills, craft...food...and no messing with mats. It looks really retro and is the best thing I ever did to protect my table. And I only have to wipe it not wash it....good for caravanning families. Oh my! You have created the perfect reading spot for "Put Me in the Zoo." 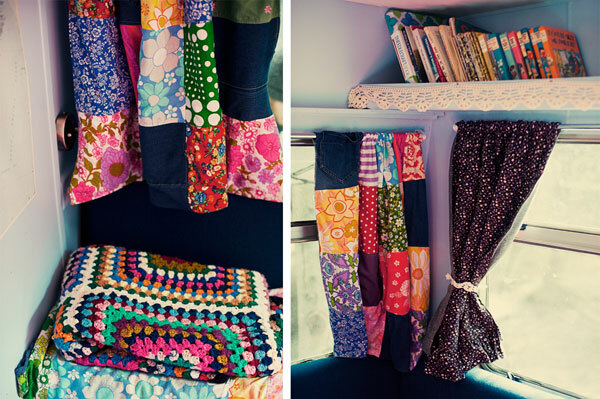 I would have loved to see have seen more of that granny square afghan that was all folded and neatly put away. Hi hi! I've just discovered your blog! 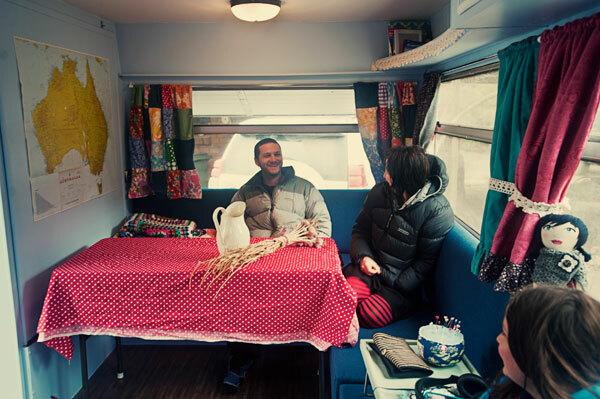 The caravan looks so cosy, and the kind of place where laughter and mischief will rule the day :) Will catch up on your adventure as soon as I get home! Wow! That is so beautiful! What did you use to paint the cupboards and walls, or did you replace all of the old cupboards with new ones instead of painting? I would love to do something similar! Love your van. 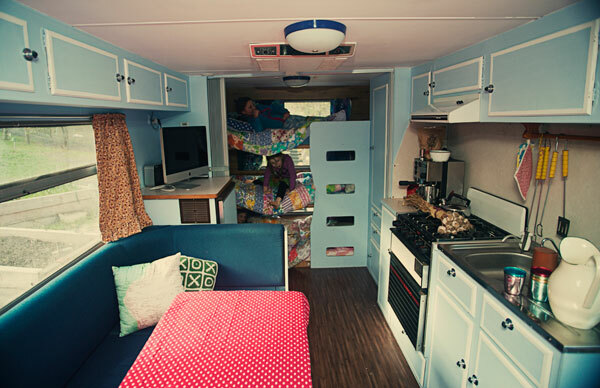 Would love to know more about the fold away bed idea... did you design it? 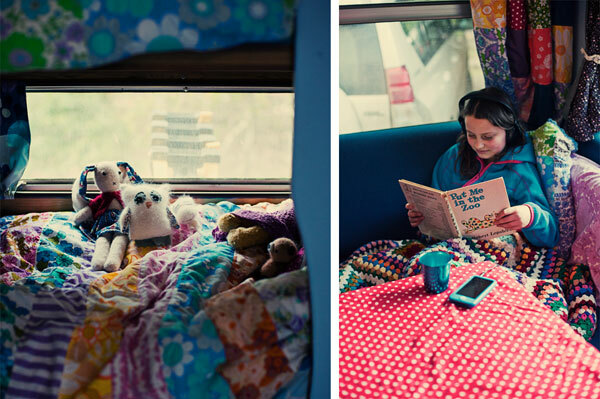 we'd love to do this in our van. Random rambling facts about today.